Out of stock since Monday, 29 January 2018. Due back soon. 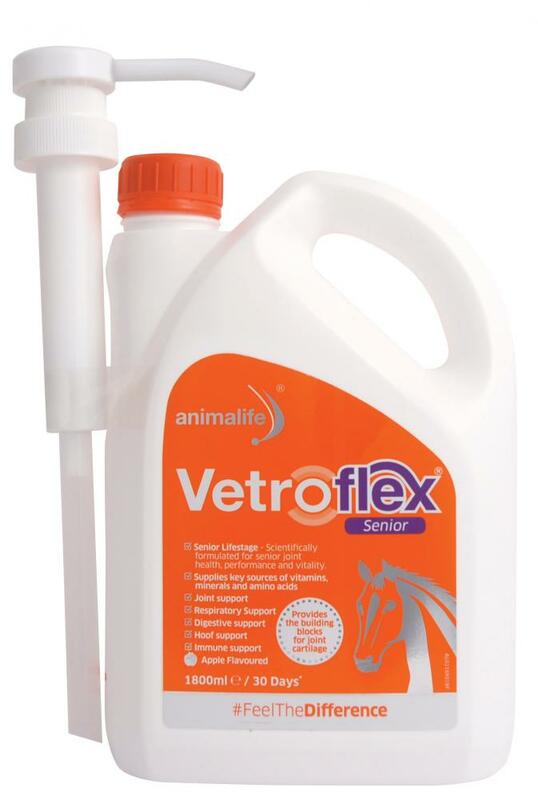 Vetroflex Senior is a proprietary blend of nutrients designed to provide support to the musculoskeletal, respiratory, immune and digestive systems of the older horse, together with added nutrients to help maintain body condition. Vetroflex Senior contains a blend of Collagen hydrolysate, FOS Prebiotic, Liquorice, Manganese, Copper, Zinc, Iodine, Biotin, Methionine, Vitamins A, D3, K, E, C, Selenium and B-vitamins. Vetroflex Senior is formulated using Specially Optimised Bioavailable Formula (SOBF) technology to ensure optimal absorption. Free from banned substances. Feed at rates shown. 1 x (60ml) serve via the easy-to-pour grip bottle with integrated measuring device. Ensure clean fresh water is always available. Hay or other forage must be available. The older horse may have a lifetime of experience behind it and many miles left on the clock, but the inextricable passage of time means that extra nutrition support is often required to help maintain performance and quality of life. The joints, after years of wear and tear; lungs from long exposure to dust in hay and bedding; changes in dentition and a gradual decline in immune system efficiency can all impact the older horse. 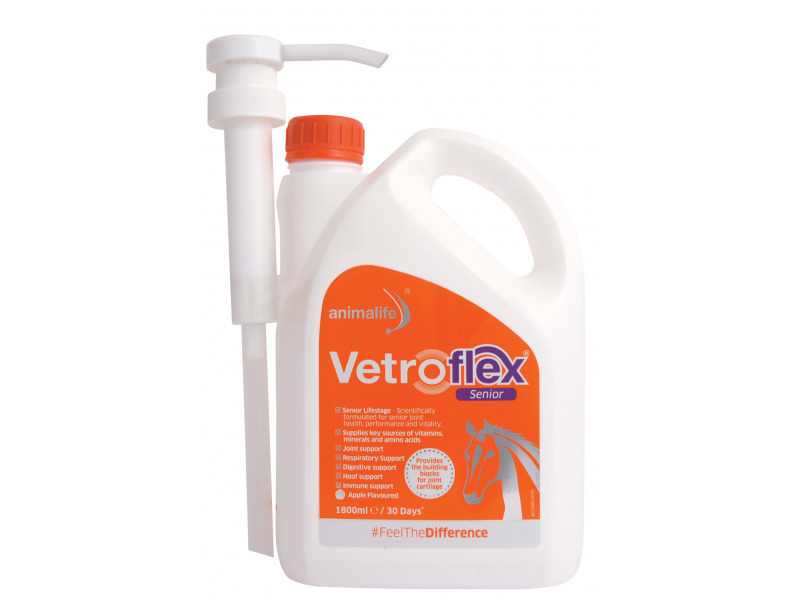 Vetroflex Senior provides specific additional nutrient support to maintain overall wellbeing, flexibility and quality of life in your horse. Joint support: Vetroflex Senior provides targeted amino acids and antioxidants to help maintain healthy joint cartilage and connective tissues. Respiratory Support: stabling, and the ensuing exposure to dust is known to increase the antioxidant requirements within the lungs; for the older horse with prolonged exposure, Vetroflex Senior provides a wide range of antioxidants, particularly vitamin C, known for its direct effect on lung antioxidant levels. Digestive support: The FOS prebiotic supports the growth of beneficial microorganisms in the digestive tract to allow optimal function of the digestive system. Older horses, especially those with poor dentition, that may have difficulty chewing their food, or for those older horses that find it difficult to hold their condition may benefit from a prebiotic. A broad spectrum of B vitamins provide a pick me up and replenish any drop in the horse’s own production caused by a reduced fibre intake. Hoof support via biotin, methionine and zinc for the correct formation and repair of hooves. Immune support: The efficiency of the immune system wanes over time. The FOS and antioxidants in Vetroflex Senior work together to provide additional support to the horse’s own natural immune defences. There are currently no questions for Animalife Vetroflex Senior - be the first to ask one!